The Gebel el-Asr quarry is an almost invisible site in the south-west of Egypt, located some 65km north-west of Abu Simbel. It is also known as Chephren’s Quarry and Chephren Diorite Quarry after the famous statue of Khafre, which is now in the Cairo Museum and was carved from stone quarried at the site. This famous statue is shown in the photo below. Before the construction of Lake Nasser, the quarry was sometimes known as Tushka Quarry, after the terminus of the 80km ancient quarry road leading from the site to the Nile. The Gebel el-Asr quarries were rediscovered in 1932 by a British Military car patrol vehicle that strayed from its intended route during a sandstorm. Two archaeological expeditions travelled to the site in 1933 and 1938. They confirmed that the site was the source of the stone for the already famous statues of Khafre, recorded the location of the remains and removed the inscribed artefacts. The same expedition excavated a loading ramp, where large blocks were lifted onto sleds or other forms of transport for transfer to the Nile, and recorded the longest surviving Pharaonic quarry road, the 80km ancient road between Gebel el-Asr and the Nile. Geological investigations were undertaken in 1990, and in 1997 the Gebel el-Asr Project began survey and excavation of loci across the site, in an effort to document and excavate the remains before any further destruction could occur. The site had been badly damaged due to the nearby reclamation and hydrological works associated with the Tushka Project, and continuing development made survey and excavation a priority. Gebel el-Asr Project studied an Old and Middle Kingdom operational centre at Quartz Ridge, excavated two stone built loading ramps and an area of Old Kingdom settlement in the south of the quarrying region. The ancient quarry road from Gebel el-Asr to Tushka was also surveyed and two Old Kingdom camps were excavated along this road. Crucially, the Gebel el-Asr Project team were able to bring the importance of the site to the attention of the then Egyptian Supreme Council for Antiquities (SCA) and obtain SCA protection for the surviving sections. Government protection should ensure some level of preservation of the site, although it can be difficult to police such a large area, particularly when it is located at such a considerable distance from nearby settlements. The early 21st century has also seen further investigation into the inscriptions from the site, particularly the Middle Kingdom stelae from the carnelian mine at Stelae Ridge. These are currently being translated by a team from Yale, who recently published an assemblage of stelae from one of the cairn-shrines at Stelae Ridge. My own PhD research concerns the physical, archaeological and landscape context of the Middle Kingdom cairn-shrines at Stelae Ridge, and I will be sharing selected elements of that work on this blog over the next few months. The 1930s expeditions were reported by Engelbach in Annales du Service des antiquités de l’Egypte (ASAE); Engelbach, R. 1933. “The Quarries of the Western Nubian Desert: A Preliminary Report” ASAE 33: 65 – 74; Engelbach, R. 1939. “The Quarries of the Western Nubian Desert and the Ancient Road to Tushka” ASAE 39: 369 – 390. The results of the geological expeidtion in 1989 are presented in Harrell, J. A. and Brown, V. M. 1994 “Chephren’s Quarry in the Nubian Desert of Egypt” Nubica 3.1: 43 – 57. Additional information concerning the Gebel el-Asr stone varieties, as well as other stones used in ancient Egypt, can be found on James Harrell’s website http://www.eeescience.utoledo.edu/Faculty/Harrell/Egypt/AGRG_Home.html. 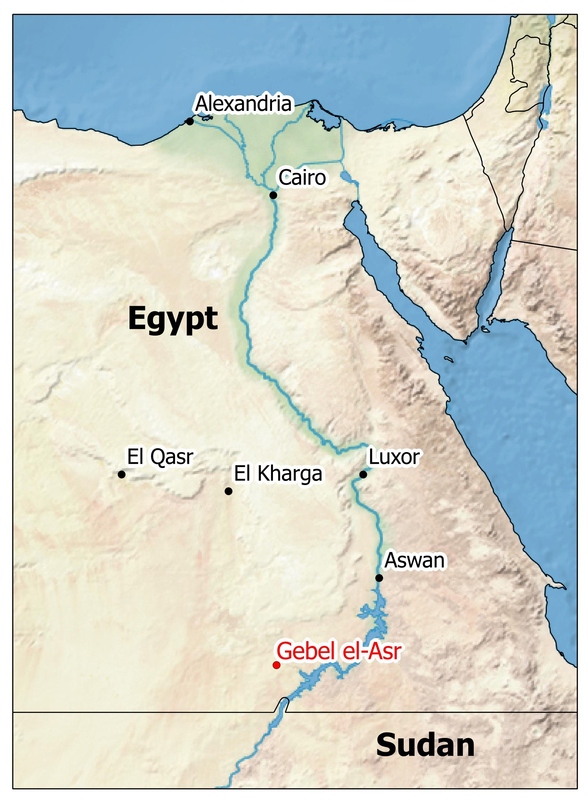 The interim results of the Gebel el-Asr Project are presented by the Project director Dr Ian Shaw and colleagues in Shaw, I. Bloxam, E. Heldal, T. and Storemyr, P. 2010. Quarrying and Landscape at Gebel el-Asr in the Old and Middle Kingdoms. In: F. Raffaele, M. Nuzzolo and I. Incordino (eds.) Recent Discoveries and Latest Researches in Egyptology: Proceedings of the First Neapolitan Congress of Egyptology, Naples, June 18–20 2008. Wiesbaden: Harrassowitz-Verlag. 293–312. For the stelae of Sabastet from Cairn VIII at Stelae Ridge see Darnell and Manassa. 2013. A Trustworthy Seal-Bearer on a Mission: The Monuments of Sabastet from the Khephren Diorite Quarries. In: H. Fischer-Elfert and R. B. Parkinson (eds.) Studies on the Middle Kingdom in memory of Detlef Franke. Philippika Marburger altertumskundliche Abhandlungen 41. Harrassowitz Verlag: Wiesbaden. 55-92. 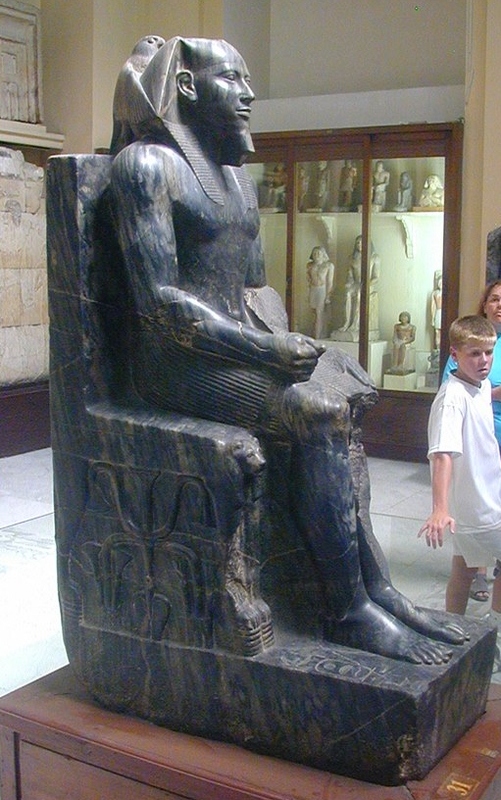 Statue of Khafre in the Cairo Museum, reproduced with the permission of Richard Sellicks.